ZnO nanoparticles were successfully synthesized by a solochemical method using zinc chloride as the precursor in a sodium hydroxide solution with ZnCl2:NaOH ratios of 1:2 and 1:3. The effects of the thermal treatment on the functionalities of the nanoparticles were investigated by comparing calcined ZnO with uncalcined ZnO. Calcined ZnO underwent a drying process at 120°C, followed by calcination at 500°C, while uncalcined ZnO underwent the drying process only. The synthesized nanoparticles were characterized by XRD and FESEM-EDX analysis. The photoactivity of synthesized ZnO was evaluated through methylene blue degradation. In addition, ZnO nanofluids were synthesized by dispersing nanoparticles into the base fluid. The nanofluidic stability in the presence of a Palm Oil-Based Primary Alkyl Sulphate (palmPAS) surfactant were investigated using a spectrophotometer UV-vis with varied PalmPAS concentrations. XRD and FESEM analysis showed that the nanoparticles exhibited a hexagonal wurtzite structure, and confirmed that the particle size increased on calcination. All the synthesized ZnO nanoparticles exhibited good photoactivity under UV light irradiation due, to some extent, to their good crystallinity. The calcined ZnO from the ZnCl2:NaOH ratio of 1:3 offered the best photocatalytic performance compared to its ZnO counterparts. It was also found that the nanofluids of uncalcined ZnO from the ZnCl2:NaOH ratio of 1:3, at a ZnO:palmPAS ratio of 1:9, offered the best stability. Conventional detergents are generally derived from fossil-based petroleum and are difficult to decompose, causing major problems to the environment. Bio-based surfactants are expected to be able to serve as substitutes for petroleum-based ones. Many advantages can be claimed for the use of bio-based surfactants, including biodegradability, low toxicity, and compatibility with people and the environment (Sekhon, 2013). In terms of detergency, the ability of surfactants/detergents can be improved by introducing additives, such as semiconducting photocatalysts. A series of metal oxides such as TiO2, MgO, and ZnO have been developed for the degradation of organic pollutants in the presence of light illumination (Guo et al., 2011). Another study has used a doped metal oxide such as C-N-titania (Slamet et al., 2017). In fact, its composites, such as CNTs-titania have also been utilized for such applications (Wibowo et al., 2015). Along with TiO2, ZnO is recognized as one of the most studied photocatalysts and has been often used in a wide range of applications. The advantages of ZnO include its cost effectiveness, large specific surface area, low toxicity, and high volume of pores (Franklin et al., 2007). Besides its excellent photoactivity in degrading organic pollutants, the antibacterial properties of ZnO against bacteria such as Escherichia coli, Pseudomonas aeruginosa, and Staphylococcus aureus are also renowned (Dobrucka & D?ugaszewska, 2016), and may be beneficial in improving the performance of detergents in the form of nanofluids. For commercial nanofluidic detergent applications, synthesis of ZnO nanoparticles through a simple and cost-effective method is preferred. Different morphologies of ZnO nanoparticles can be produced by both chemical and physical methods. Physical methods usually involve complicated processes, severe operating conditions, and sophisticated equipment. The solochemical method is one of the chemical processes; it is cost effective and simple, and can be implemented to produce ZnO nanoparticles. In this process, chemical reactions of the zinc precursor in a heated alkaline solution are conducted at a controlled temperature (Vaezi & Sadrnezhaad, 2007; Gusatti et al., 2010). Owing to its simplicity and versatility, the solochemical method is a promising approach to commercial production of ZnO. Another issue in the context of nanofluidic systems is the stability of the nanoparticles dispersed in the medium. Addressing such a topic is of great importance, because ZnO nanofluids have a tendency to agglomerate, interrupting their effectiveness as photocatalysts. Several factors affect nanoparticle stability, including pH, ionic strength, particle surface chemistry, and interactions of nanoparticles with other pollutants and natural organic molecules (Baalousha et al., 2008; Jiang et al., 2009; Molina et al., 2011; Omar et al., 2014). Aggregates or agglomerates of nanoparticles and microparticles are formed because of Van der Waals force or other attractive forces (Chabni et al., 2011). Agglomeration is a reversible process and in most cases can be broken down with sonication or homogenization, or the addition of ions (changing H+) into the system (Berg et al., 2009). A study has been conducted by Tso et al. (2010) on the stability of ZnO nanoparticles in waste water, showing that they can retain their nanoparticle size even after hours of suspension, due to the existence of organic colloids, such as humic substances or surfactants in the water. The results of Tso et al. are in line with those of Keller et al. (2010), who reported that the sedimentation rate is quite high when ZnO is dispersed on natural aqueous matrices, where the total organic content is low and ionic strength is high. Several surfactants have been employed in ZnO nanofluidic systems, such as sodium dodecyl sulfate (SDS), cetyltrimethylammonium bromide (CTAB) and sodium carboxymethyl cellulose (NaCMC). Marsalek (2014) suggests that adding CTAB improves ZnO stability around neutral pH, while adding that NaCMC does not significantly affect the stability. In the same report, it was also suggested that adding SDS improves stability around alkaline pH. Brine was used in another study with the addition of sodium dodecyl sulfate, sodium dodecylbenzenesulfonate and oleic acid at pH 2, and it was revealed that all the surfactants were able to improve the stability of the nanoparticles (Adil et al., 2016). In this paper, we report the effects of natural-based surfactants, specifically palm-oil based primary alkyl sulphates (palmPAS) on the stability of ZnO nanofluids, which, to our knowledge, has not been studied before. The study investigates the stability of ZnO nanofluids in the presence of palmPAS. ZnO nanoparticles were synthesized via a solochemical method and the photoactivity of ZnO was evaluated via degradation of methylene blue. This report specifically addresses a simple way of synthesizing ZnO nanoparticles and evaluates the stability of their nanofluid in the presence of palmPAS. Further research on detergent formulation and performance will be made in a subsequent study. ZnCl2 and NaOH were acquired from Merck Chemicals, aquadest was acquired from Wiloso Chemicals, palmPAS was acquired from Kao Chemicals, and TiO2 P25 was acquired from Evonik. All the chemicals were of analytical grade and used as received. An amount of ZnCl2 was prepared in 200 ml aquadest to produce a 0.5 M solution, while 1 M NaOH was prepared separately in 200 ml aquadest with constant stirring. The NaOH solution was heated to 90°C and the ZnCl2 solution was slowly added into the hot NaOH solution while the temperature was maintained at 90°C for 2 hours. The nanoparticles formed were then centrifuged and washed using aquadest several times, followed by drying at 120°C for 1 hour. Subsequently, they were ground using a pestle and mortar. Half of the nanopowders then were calcined at 500°C for 2 hours. The nanoparticles were characterized for their crystallite structure using a PANalytical Empyrian X-Ray Diffractometer with Cu k-? radiation (???? = 0.15406 nm). Field Emission Scanning Electron Microscopy (FESEM) and Energy Dispersive X-ray Spectroscopy (EDX) were performed using a Focused Ion Beam JEOL JIB-4610F. Methylene blue (MB) photodegradation was examined as a model reaction to evaluate the photocatalytic activities of ZnO. The photocatalytic experiments were performed using a mercury lamp as a light source. 0.1 g of synthesized ZnO and 5 ml of 10 ppm methylene blue were added into a vessel. Commercial TiO2 nanoparticles were used as a benchmark for the photocatalytic performance. Subsequently, the vessels were put inside a photoreactor prototype. Every hour, each vessel was moderately shaken to redistribute the nanoparticles. A photographic method and spectrophotometer were used to investigate the photocatalytic activities. The photographic method was performed by visually comparing the color of each vessel and a spectrophotometer UV-vis was used to evaluate their absorbance before and after 6-hour photoreaction. Palm oil-based primary alkyl sulphate (PalmPAS) surfactants were added into 100 ml aquadest with constant stirring. 0.1 g of uncalcined ZnO nanoparticles were directly poured into the palmPAS solution, stirred for 30 minutes and dispersed by ultrasonication for 30 minutes. The PalmPAS:ZnO ratios varied between 1:1, 1:5, and 1:9. This procedure was followed for ZnO from the ZnCl2:NaOH ratio of 1:2 and ZnO from the ZnCl2:NaOH ratio of 1:3 for both uncalcined and calcined ZnO nanoparticles. ZnO from the ZnCl2:NaOH ratio 1:2 and ZnO from the ZnCl2:NaOH ratio of 1:3 are subsequently reffered to as ZnO 1:2 and ZnO 1:3 respectively. Nanofluidic stability was measured using an Agilent Cary 60 UV-Vis Spectrophotometer by evaluating the absorbance of the nanofluids periodically for three hours. ZnO nanoparticles were successfully synthesized using a simple solochemical process. XRD analysis shows that the nanoparticles have a hexagonal wurtzite structure with good crystallinity. Estimated particle size from the FESEM data is shown to increase after the calcination process. Calcined ZnO with a ZnCl2:NaOH ratio of 1:3 has optimum photocatalytic activity compared to the other synthesized ZnO samples. 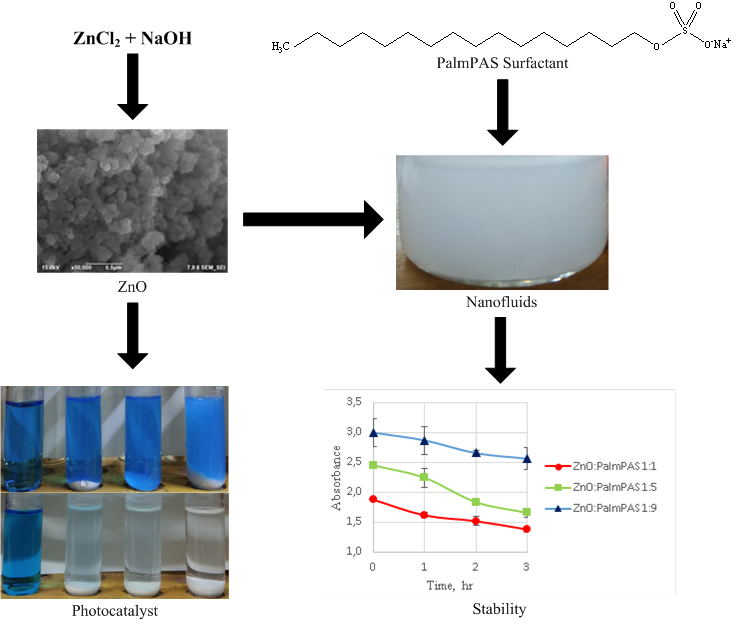 A bio-based surfactant (palmPAS) can be used to improve the stability of ZnO nanofluids, with uncalcined ZnO having the ZnCl2:NaOH ratio of 1:3 and ZnO:palmPAS ratio of 1:9 offering the best stability. The authors acknowledge financial support from the Directorate of Research and Community Services, Universitas Indonesia through The Research Cluster Grant 2017 (Hibah PITTA 2017) – contract number: 837/UN2.R3.1/HKP.05.00/2017.